Not a dive location, Ubud is located in the central foothills of Bali. It is recognised as the cultural and artistic hub of Bali and provides a lovely peaceful haven for those wanting to off-gas and unwind in a cooler climate. There are many exciting things to see like Bali painting workshops, silversmiths at work and batik making in and around Ubud. Located in the mountains just 30 minutes north of Ubud, Bagus Jati’s 5 hectares of hillside gardens make this a haven of peace and tranquility. Whether you are seeking a peaceful stay pre/post diving or a wellbeing retreat, Bagus Jati provides a unique experience with easy access to Ubud and the surrounding mountain areas. Individual villas with wide verandas, each built with privacy in mind. 8 Deluxe Spa Villas, each with private massage facilities, 10 Superior Villas. On-site organic garden; yoga and meditation; on-site spa; genuinely rural Bali. 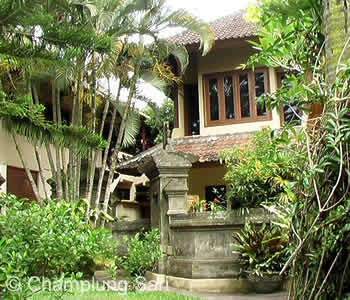 A great location in Ubud with the Monkey Forest Sanctuary immediately adjacent to the hotel. Pleasant gardens create a restful environment, with two streams running through the property. 63 accommodation units are offered in Standard, Superior and Deluxe categories. The sacred Monkey Forest is at your doorstep. The resort is perched above the Ayung River; all rooms and villas have views to the valley and surrounding hills. Deluxe Rooms are located on the ground floor and Superior Rooms are on the upper level. The Valley and Pool Villas are built above the valley and provide stunning views. The resort’s location makes an ideal base for touring the surrounding countryside and is just 5km from Ubud. 56 Rooms in 14 two-storey buildings and 8 Villas. Award-winning eternity pool on the edge of the ravine. This award winning luxury resort is a pure delight. Nestled between the Petanu River valley and surrounding rice fields, the grounds are spacious, guest accommodation thoughtfully designed, and the outstanding service provides a true retreat. Just minutes from central Ubud. 48 Deluxe and Superior Rooms in 2 wings, plus 60 individual Villas including the Presidential Villa. For a touch of luxury! The hotel offers Deluxe or Family Rooms with garden or rice field views. For guests who wish to explore both central Ubud and the surrounding areas, this hotel offers a location which allows good access for both. The hotel provides a shuttle service to the Ubud Palace and Art Market. 34 accommodation units, including family options. Avoids central Ubud traffic, yet within walking distance of all shops, etc. Remember that in your Dive Safari package or Holiday Package, you will benefit from the special Ubud Hotels & Resort rates we receive. The above are samples of the type of accommodation we can arrange for you. 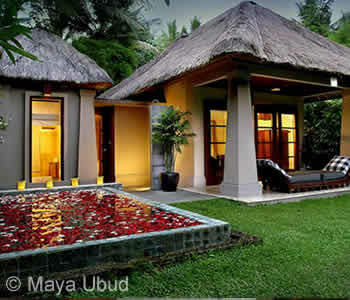 The Ubud hotels we have listed all have AC, hot/cold water and swimming pools unless otherwise stated. Of course this is not a complete list, nor does it represent the full range of hotel styles and levels of accommodation available in the Ubud area of Bali’s central foothills. Let us know what you are seeking and we’ll make recommendations for you.